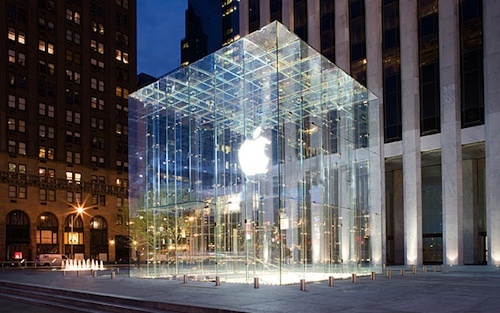 ifoAppleStore reports that Apple has begun work on a $6.6 million project to revamp the plaza at its flagship Fifth Avenue retail store in Manhattan, home of the iconic glass cube entrance leading to the underground retail space. As part of the project, Apple will be temporarily removing the glass cube to install new pavers on the plaza. Workers reportedly appeared on site last night and began fencing off areas around the store to begin work on the project. Building permits issued on June 13th state the work will also include removing protective bollards, installing new pavers around the cube's perimeter, and removing and reinstalling surrounding water drains. According to the permits, the work could be finished by early November. It is unclear whether Apple will be replacing the glass panels of the cube or making other changes to the structure, or simply temporarily removing the cube to facilitate other drainage and paver work on the plaza. Apple's Fifth Avenue store opened in mid-2006 as the gleaming flagship of the chain, operating 24 hours a day. Despite the company having opened a number of significantly larger flagship stores around the world in the following years, the Fifth Avenue store has maintained its position as one of the busiest and most-visited stores in the company's retail chain. 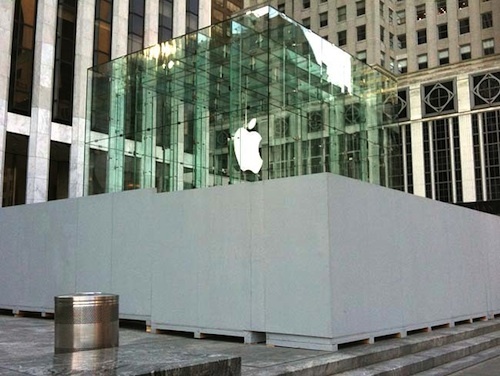 Update: ifoAppleStore has added a couple of photos of the gray plywood barriers around the plaza. It's an Apple store. It's not the Louvre. Check out the Met, it's on 5th ave. It's also quite nice. Steve wants to try out some of that new curved glass they are to use on the new campus. Still a lot of non-apple related place to visit. Remove all that to replace some pavers? Right, and I got your iPhone6 for you right here. I think they're upgrading to a Retina Cube. This is truly news worthy. I wonder if they are painting any stores? They probably vacuumed last night. I got those on my list too. I have crown access to the statue. Don't slip in the slime.....You will wake up feeling like a million bucks. That's the pyramid-shaped Apple Store, isn't it? I heard that they are going to replace the Statue of Liberty with a statue of Steve. and rename it "Statue of InsanelyGreatness."